Streets of Fredericksburg real estate are rich with history. Men and women of modern times can walk in the footsteps of America’s forefathers and roam the halls where history was grown. Washington Heritage Museums dot the landscape and welcome visitors through their doors. Four established properties shed light on life and culture in the 18th century. 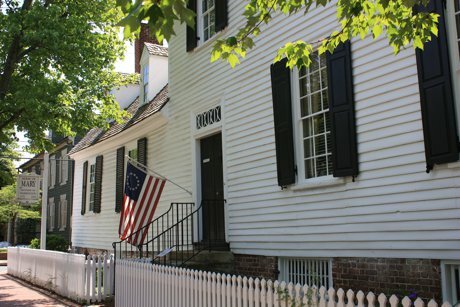 The Mary Washington House sits proudly at 1200 Charles Street. A gift from George Washington to his mother, Mary Ball Washington pleasantly lived out her life in this charming abode. It was said that prior to the 1789 inauguration George Washington stopped by the Fredericksburg home for some words of wisdom before officially becoming president. A few steps away at 1300 Charles Street, the St. James House represents an eighteenth-century frame house. Guests of the dwelling openly admire the collection of antiques in the rooms and stylish decor staying true to the time period. Over at 1304 Caroline, the Rising Sun Tavern has some colorful stories to tell. Whispers of past celebrations and commiserations fill this piece of Fredericksburg real estate. A busy, roadside tavern in 1792 many weary travels sat for a spell wetting their whistle and cooling their heels. The Hugh Mercer Apothecary Shop neighbors the tavern and can be found at 1020 Caroline Street. Practicing medicine for over fifteen years, Dr. Mercer often treated his patients with traditional methods such as with leeches, crab claws and snakeroot. Closing up shop the good doctor joined up with the Revolutionary army dying at the Battle of Princeton with the rank of Brigadier General. History buffs and patriotic spirits adore these four treasured buildings. A reminder of simpler times the Washington Heritage Museums symbolize the deep roots of America. Tours are readily held and open a window back into the past. Hours vary by property and by season. More information can be found on scheduling a tour on the website. Members and volunteers are vital to the successful preservation of these facilities. Membership options vary and include complimentary admission, discounts and privileged events. Consider becoming one and being a part of preserving priceless history.